#6......"THE PURGING OF CI5" - BODIE 3.7 . you'll never walk alone ! That's a lovely image! Unusual, too, to see Bodie with that kind of troubled expression shown so vividly in his eyes. Very, very good. Thanks a lot. thankyou so much and yes he does seem troubled though knowing Bodie i'm certain he will shake himself out of it . Oh dear , how has that happened . The only thing i can think of at present is to put your images through flickr and resize them or email me one or two and i will see if there is anything i can do to help or if i have the images also then i would resend them to you . Thanks so much for your offer of help, you're incredibly kind. I'll try flickr but I think it might be to do with Mozilla updates and it's also to do with the table format I'm using i.e. the images are the right size until I post them into a table so I'm going to try and show them in a different way, perhaps using 2 lists. Thank god AO3 is a bit less temperamental than live journal. Poor Bodie. He needs hugging, doesn't he? bless him ...a hug from his Doyle may be in order or if not i can help in that department . Thankyou so much for looking . His expression is so soft, somehow tender. Lovely. Thank you again for all the beautiful images you share. thankyou for your lovely comment . This image of Bodie has a soft glow around him but his look is one of trouble ahead and you are very welcome as to all my images..i hope you enjoy looking at them. thankyou so much , he does look in need of some comforting here but the look in his eyes says he won't need help for long though Doyle will be right there with him if he needs him . This is a perfect pair with the anxious Doyle from the same series. It's not often you see Bodie looking concerned rather than angry. He's a fighter not a worrier. But he's not insensitive and things do get to him. Thankyou so much , yes you can see in his eyes that he is troubled but knowing Bodie that won't last for long as you say he is a fighter and he will fight on I'm sure . Love this one, and yes it's an unusual one for Bodie - he almost looks as if he has tears in his eyes. One of the things I love about LC is that he had a really good range of expression and great acting skill, and I've always felt sorry that he wasn't always called upon to use it to its full extent. He's a great (and delicious!) action hero, but he's also plenty more! 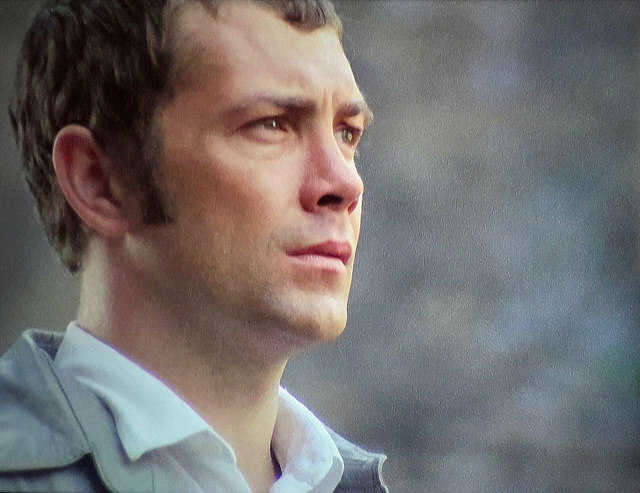 then I'm biased when it comes to Lewis Collins. Oh how lovely! He looks like a troubled angel here.